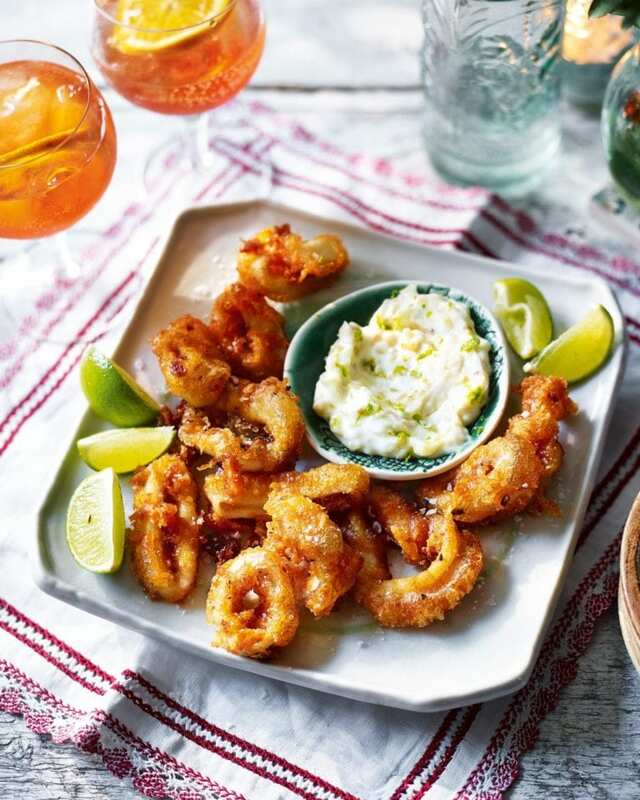 Crispy squid, garlicky aioli and a refreshing Aperol spritz – what more could you ask for on a warm summer’s evening? cornflour, plain flour, paprika and some salt and pepper in a mixing bowl, then slowly whisk in the prosecco to form a smooth batter. Rest for 15 minutes. Half fill a deep, heavy-based saucepan with vegetable oil, then heat until it reads 180°C on a digital probe thermometer or when a cube of bread turns golden brown in 30-40 seconds. Working in batches, dip the squid rings in the batter, then lower gently into the oil. Fry for 2-3 minutes until crisp and golden, then remove with a slotted spoon, drain on kitchen paper and sprinkle with salt. Serve with lime wedges for squeezing over. Meanwhile, combine the aïoli ingredients in a bowl and season to taste. For the Aperol spritz, fill 8 wine glasses with ice, then pour 75ml Aperol, 75ml prosecco and 25ml soda into each. Top each with a slice of orange to serve.